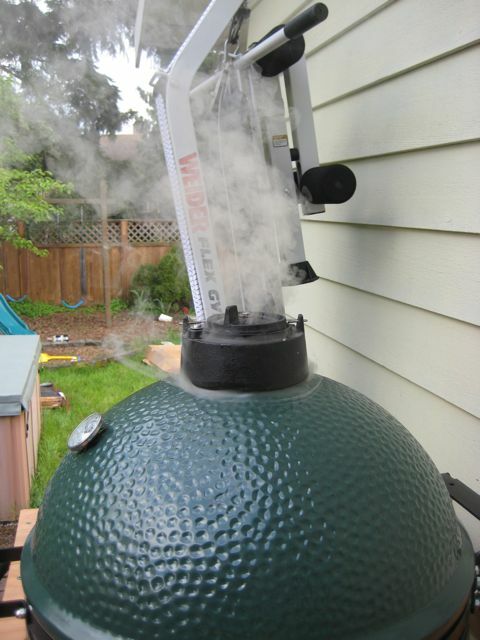 I bought a Big Green Egg BBQ during May 2011, here i'm just logging some notes/links about it. I bough it from a local dealer (Aquaquip), I don't like dealers much but they where very prompt with emails and friendly. A sale was going on, so the price was quite good. I bought a large egg alone (IMO there shelves and nest are not that great and overpriced), was gonna make my own BBQ table anyway. The fire grate was missing from the box, but they got me a replacement right away and gave me a discount on the PlateSetter (must have) and a Baking stone(Nice to have). 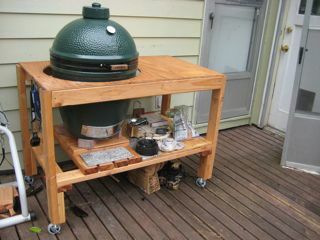 Not very hard, but I waited to make my table first, so that i could put the egg on the table first, then mount the lid. 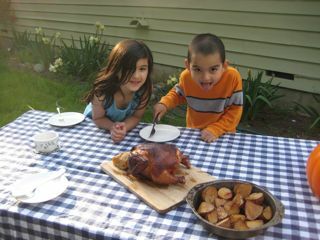 The whole egg assembled would be a bit much for one person to set into the table (~150 pounds). Now it's not super-cute for it was very quickly made(wanted to use the egg) and very affordable. I just used 2x4 's and some 1/2 inch plywood I had (leftovers from building a camper), then stained it with Watco oil. 4 hours later it was ready to BBQ ! I had some pasilla perppers, so I filled them with onions, cheese (smoked gouda & laughing cow) and grilled them at 350 or so for a while (45mn) .. that turned out OK but not great ... of course i made this up of left-overs with no recipes. 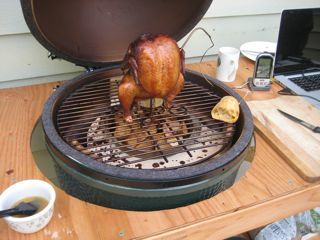 I also put some potato wedges(with a little oil) in the drip pan under the chicken. Tuned out good, super super moist ... yummy, only minus is that the skin wasn't all that crispy though. The potato wedges where very yummy, full of chicken drippings and caramelized/crunchy at the bottom. Got some really nice USDA Prime ribeye steak at Costco (6.99 per #), covered them in salt, steak spices and ground peppers and seared them at 650 degrees .... that was spectacular ! However my ribeye where quite a bit thicker (~1.5+ '') so in my case it was 3mn + 3mn + 4mn. It was very very yummy, nice crispy crust and perfect medium rare center as I like it. Really wanted to take a pic of that but the camera was nowhere to be found. 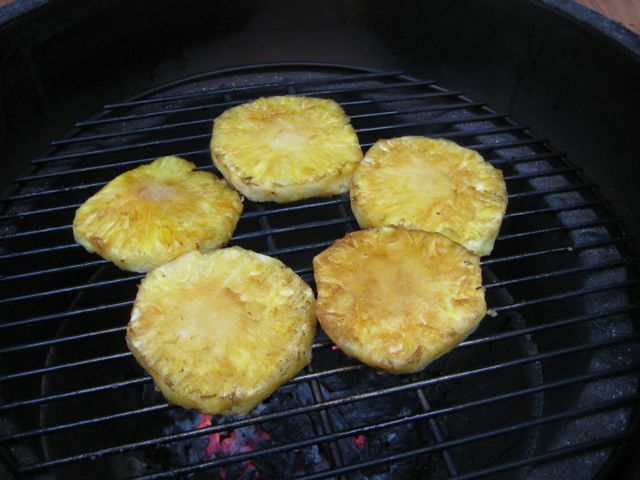 Just soaked them in cold water for ~1 hour and put them on the grill (with husk) at about 350 for 90mn. Removed, opened, buttered ... yummy ! 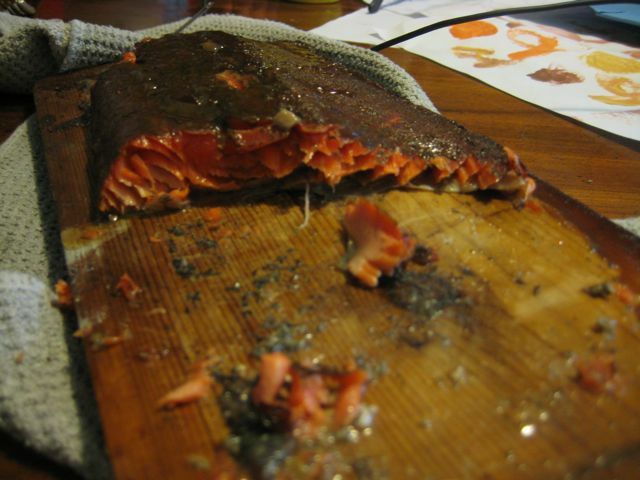 Picked up some copper river salmon at Costco. That turned out amazing ! In this case, the simpler, the better. 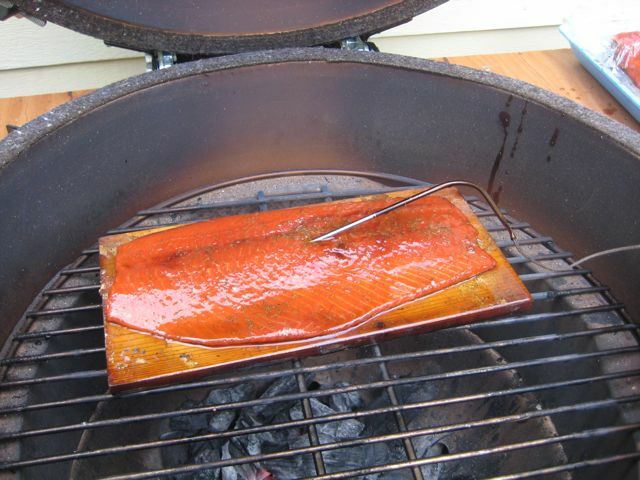 I had done coper river salmon in my flower pot cooker before and it had not turned nearly as good. 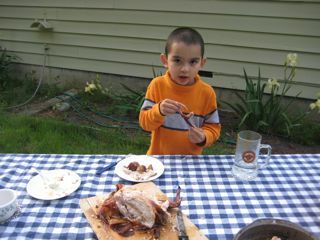 Then I just grilled it at ~350 until done (used a termometer ... about 20 mn) with a few apple tree pellets (light smoke).